Recently there have been three announcements of new forest cover, land use and DEM data. These have very high spatial resolution (30 m) at global scales, and are a great data source if local data is not available. Global forest cover change data provides 30 metre resolution for the years between 2000 and 2012. It includes yearly forest loss and gain data in addition to cloud-free landsat 7 imagery. It does not identify forest stand data. In addition to identifying areas of forest loss, I have also found it useful to update forest stand inventory data to show where forest cover has been gained or lost. 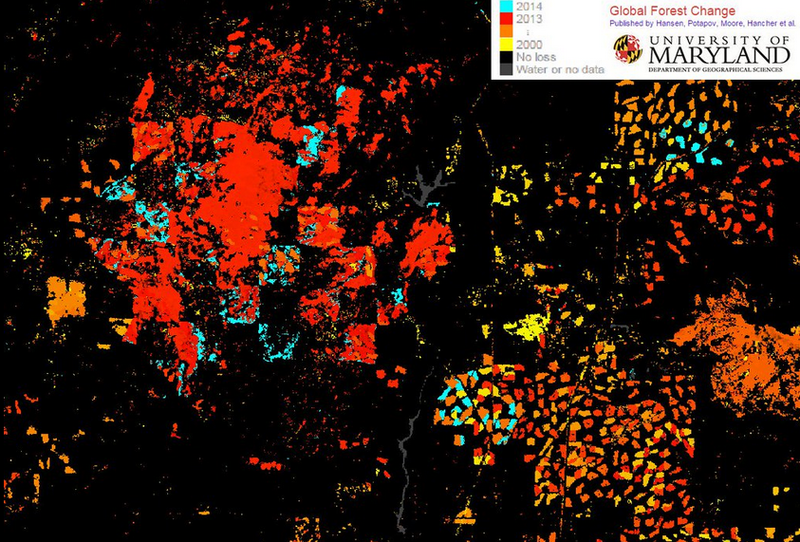 Global land cover data provides 30 m resolution data for the years 2000 and 2010. It includes cultivated land, forest, grassland, shrubland, water bodies, wetland, tundra, artificial surfaces, bareland and permanent snow and ice classes. Like most remote sensing classifications there is confusion separating water bodies and wetlands from other land cover classes correctly. However, at this scale it is comparable and more up-to-date than the GeoBase Land Cover data. The data also allows for land cover change analysis between 2010 and 2000. NASA has announced that next year they will release global 30 m resolution DEM data for the year 2000. Previously, DEM data of this resolution was only available for the US, and the highest global data was 90 m resolution. In addition, ESRI has announced that it will make this data available through their world elevation layer. While the data will be outdated (2000), especially in urban areas and areas of high erosion, it will be an alternative elevation source to GeoBase and GeoNB. While similar in resolution to these sources, the ability to compare the precision between sources will be valuable.